"Like any good jazz musician, Jenny uses her voice as an instrument, improvising and playing with the melodies... the kind of singer that goes deep into the song and makes you feel the lyrics." 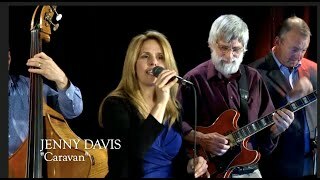 Jenny Davis, international jazz vocalist and composer is more than just a vocal interpreter of songs, her creative improvisations and original compositions place her squarely in the category of nothing other than serious jazz musician. Jenny earned her Masters of Fine Arts in Music Composition from Vermont College of Fine Arts, and a Bachelor of Music from the prestigious Cornish College of the Arts., where she was awarded scholarships from both institutions. An experienced straight-ahead jazz vocalist, she actively performs throughout the U.S., Canada and Europe. In 2018 her tour included Philadelphia, New York City and Lyon, France. With three successful albums, she has spent much time in the recording studio, and is currently working on her fourth album of all original compositions with the Jovino Santos Neto Big Band, and the Grammy nominated, Sirius String Quartet. Read more. Watch all of Jenny's Videos! Click here.